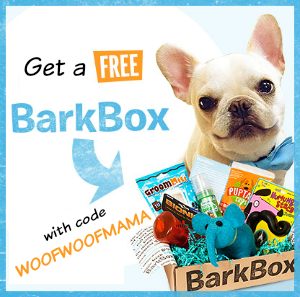 Looking for all-natural dog treats made with no artificial ingredients or fillers? 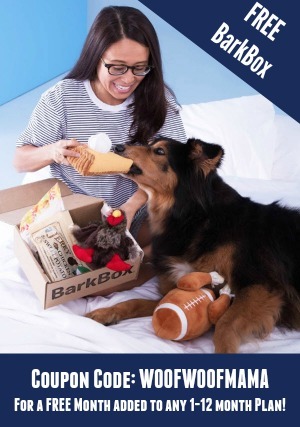 Get your dog a variety box filled with healthy chews and treats hand-selected by our pals over at Best Bully Sticks! Makes a great gift idea, for homes with multiple pets, and perfect for sharing if you are having a dog party or local meet up with your favorite dog group! It is recommended that you store all of these natural treats in the freezer or refrigerator since they do NOT contain any preservatives. Tip: No need to thaw, your dog will love them frozen! 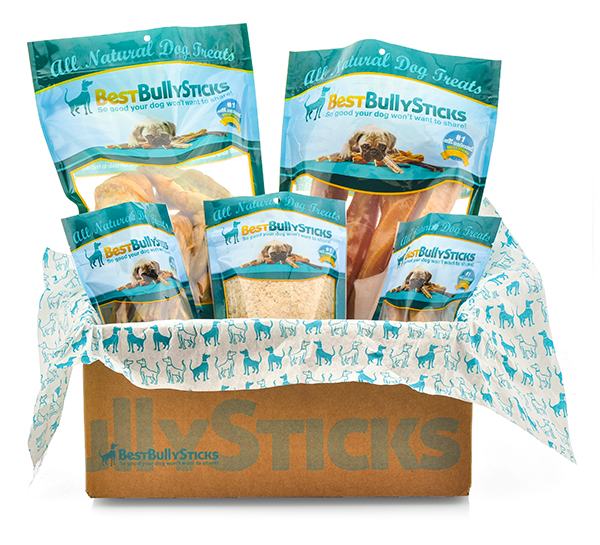 Visit BestBullySticks.com for this and more natural chews and dog treats. 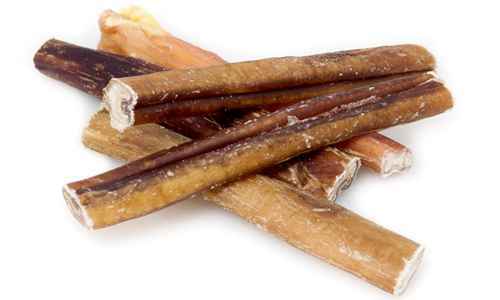 Bully sticks are a great dog treat but can be pricey, and not all chews are made with the same quality standards. Only Natural Pet Free Range Bully Sticks are made from free range, grass-fed Brazilian cattle raised without the use of growth hormones, antibiotics, or any other unnatural additives commonly used with feed lot cattle. The result is a 100% all natural chew that’s low in fat, high in protein, completely digestible, and a perfect accompaniment for any healthy diet. And unlike rawhides, these bully sticks are not treated with any bleach or other harmful chemicals. Right now you can snag a deal when you use Only Natural Pet promo code: AFWHOLEBLY to save 66% on Free Range Bully Stick 4” 10-Pack, was $14.99, now $5 + Free Shipping. You can add up to 2 10-packs to your cart; promo code good for 1 order per customer. Valid through 6/28 (if supplies last that long). Visit OnlyNaturalPet.com to get the deal today. 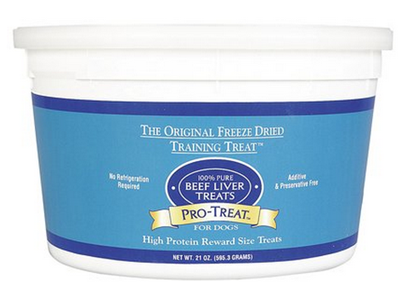 Pro-Treat Freeze-Dried Beef Liver Dog Treats 51% OFF + Free Shipping! 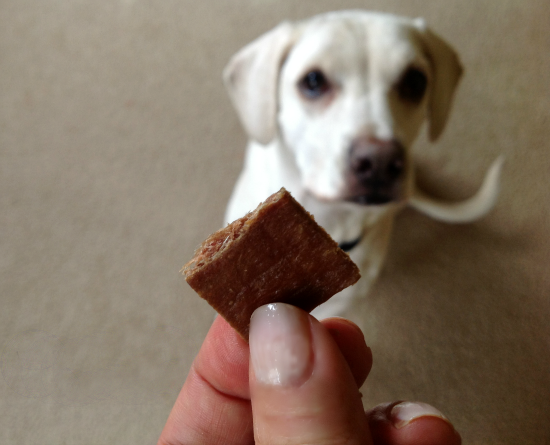 These Pro-Treat Freeze-Dried Beef Liver Dog Treats are some of the very first training treats we ever got for Daisy, thanks to the recommendation of her trainer. Not only do dogs LOVE them, but they are all-natural and a tub lasts forever! The 21 oz container lasts us about 4-6 months (using tiny bits NOT full cubes) and is on sale right now for $26.99 ($54.87 reg) with Free Shipping included! Daisy has been hard at work testing out some new goodies and we’re super excited to tell you about them! As you may know, there have been safety concerns recently about the chicken jerky and treats from some brands that were imported from China, or that were made with sub-par ingredients. This is something I always watch out for carefully and wouldn’t agree to let Daisy try new treats unless they were something I could feel good about. Things I make certain of before giving Daisy treats: that they are made in the USA and that they are made from natural ingredients. I’m also pretty careful to research the brand carefully if I haven’t heard of them before. Luckily, we were already familiar with the great reputation of the KONG brand when they invited us to try KONG Natural Jerky Premium Dog Treats in both the Beef and Chicken varieties! Daisy tested both the chicken jerky and the beef jerky over the past several days. I’d say that if she had to pick a favorite, it would be the beef, but both disappeared faster than I could photograph! The treats have a real “jerky smell” so that might be part of what makes dogs love them so much. 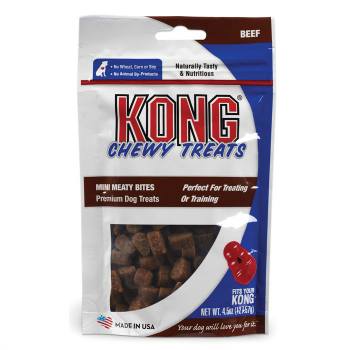 Many dogs won’t have a flavor preference between the two, but some might have a food sensitivity to one or the other, so it’s great that KONG Treats makes both varieties. 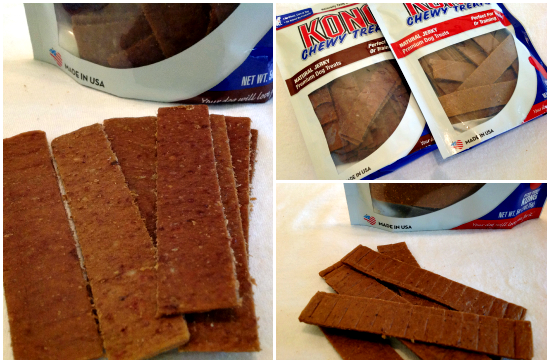 New KONG Premium Dog Treats – Fun, Yummy and Made in the USA! You’re probably already familiar with the KONG name and know it’s a brand you can trust. Daisy’s very first toy was a KONG and I’m sure the same is true for many of your fur babies, too. Now come KONG Premium Dog Treats. 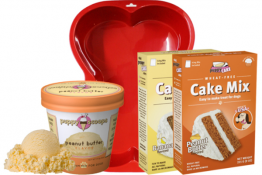 Made in the USA with natural ingredients, these treats contain NO wheat, corn or soy and NO animal by-products. 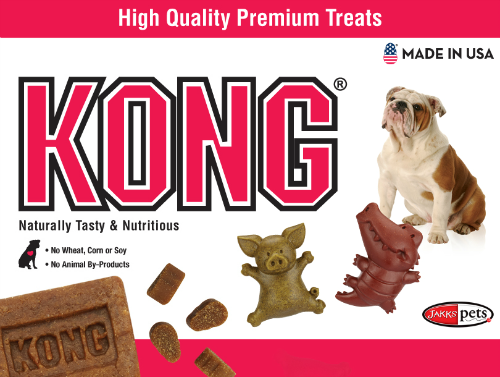 Each type of treat in the new KONG treat line is made with premium meats, fruits and/or veggies. 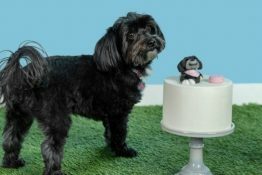 And in addition to being fun and yummy, many of the treats are also designed to meet a specific need including Dental Care, Skin & Coat, Allergy Sensitivities and more. 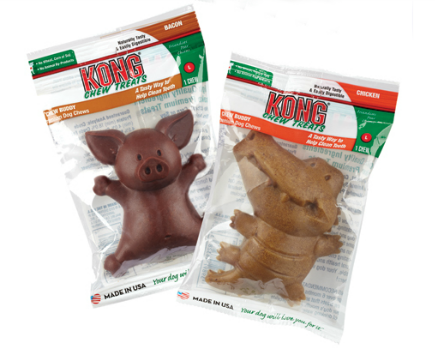 KONG Chew Buddies are adorable critter-shaped chew treats that come in Bacon, Chicken and Fresh Breath Flavors. I especially love the idea of the Fresh Breath chews made with Alfalfa and Parsley! All three varieties are naturally tasty, easily digestible and designed to treat your dog and help clean their teeth as well. Because of the cute character shapes, they’ll make an excellent Stocking Stuffer this holiday season! 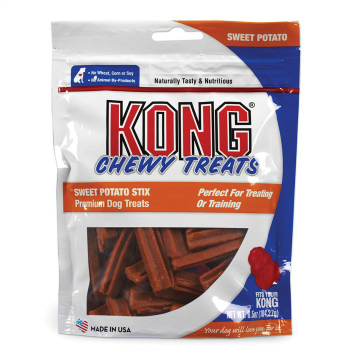 KONG Sweet Potato Stix are a super tasty vegetarian dog treat made with healthy, whole foods like real Sweet Potatoes, Carrots and Peas. They are great as a training treat and they are also designed to fit in your dog’s classic KONG toy! In addition to being a natural flavor that dogs love, these sweet potato treats are also great for adding beneficial antioxidants, vitamins, fiber and potassium to your dog’s diet. They come in a resealable bag, too! KONG Mini Meaty Beef Bites are tiny treats with big beefy flavor! These tasty little treats are wholesome, chewy and made with Real Beef…along with good stuff like Rosemary, Maple Syrup and other natural flavors. These bite-sized bits are perfectly portioned for pocket training treats to take on the go! 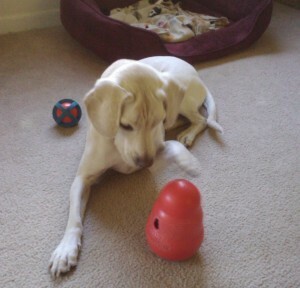 You’ll also be interested to learn that they fit in the KONG Wobbler. Daisy loves her Wobbler, and when we fill it with tiny treats or kibble, it keeps her occupied and challenged while she works to get the treats out. 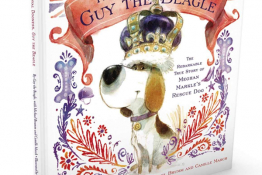 Want to know more about these tail-waggingly good treats? In addition to visiting the KONG Premium Dog Treats web page, you can also become a fan of KONG Treats on Facebook! Not only will you find special offers and deals, but you can also follow the KONG Treats Instagram feed plus shop for select KONG Premium Dog Treats right from Facebook!